This beautiful hand stamped puzzle piece necklace would be a wonderful gift for any of your friends or family members who are passionate about autism awareness. Show your support for those who live and love someone with autism. This Sterling Silver Oval Charm may be personalized for free with any name in kismet font. A Sterling Silver open puzzle charm is included to help spread autism awareness. 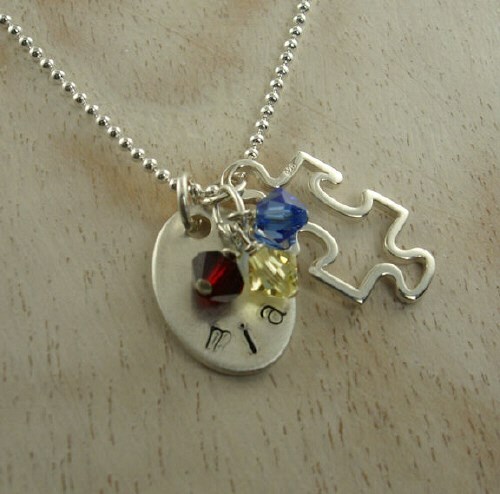 The charm and puzzle piece are accented with a red, yellow and blue Swarovski Crystal. Please choose to stylishly hang this touching charm on a 16” or 18” ball chain necklace. Today’s Price: $50.99 In Stock! Choose Necklace Length: -Select- 16" 18"
Please note that these items may ship separately from the other items on your order. Please allow an additional 2-3 business days to receive your items. Rush, Express and Urgent delivery is not available. Additional Info We offer a number of autism awareness jewelry pieces, but this hand stamped puzzle piece necklace is one of our most special. It's unique and comes complete with a selection of Swarovski crystals. Another one of our autism awareness pieces is our Autism Awareness Ribbon Hand Stamped Necklace.